At first, even though we’re people who work with words, we seemed to not be able to find any to describe what we were seeing. airplane made me realize that if I don’t do something now there will be no nature left to see. There will be no mountains. The whole notion that this is a good thing because you can put a golf course or a Super WalMart there is absolute poppycock. The regulators are holding the companies to the lowest possible standard. It’s all of our concerns. What I’ve seen the past few days was shocking and stunning. This is a much bigger problem than one region of the state. It is really a national problem. The thing that most affected me was people who told about their experiences. To hear the pain in their voice, there is no way you cannot sympathize with them and begin to understand. We really have to do something folks, we really have to do something. I don’t see how you can be a human being and do this to the earth. This has been a life-changing experience for me. I keep going back and forth between rage and wanting to cry. A growing community of Kentucky authors, photographers and artists have lent their talents and voices to the campaign for an end to mountaintop removal and valley fills, and a better future for coalfield communities. Though a number of the authors have been members and supporters of KFTC for years, their efforts began to focus on the mountaintop removal campaign after a Kentucky Authors Mountaintop Removal Tour in April 2005. Inspired by noted Kentucky essayist, poet and farmer Wendell Berry, the tours allowed a close-up look at mountaintop removal and attempts at reclamation, and an opportunity to hear the stories of coalfield residents whose lives and communities have been disrupted by this practice. A second authors tours took place in October 2005, and two more in 2006. Outraged by what they heard and saw on their tours – and the callous response of the coal industry to the concerns of citizens – the writers issued strong public statements at the conclusions of their tours. They also have used their talents to create a better understanding of mountaintop removal and its consequences through numerous essays, op-eds, feature stories, photography exhibits and letters to the editor. 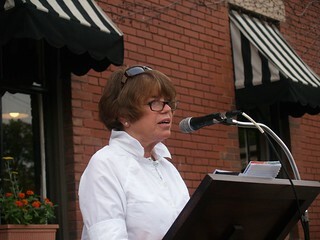 Joined by other writers, these authors have participated in public presentations about mountaintop removal that have drawn large crowds in Frankfort (with Poor Richard's Bookstore), Louisville (with Carmichael's Bookstores), Lexington (with Joseph-Beth Booksellers and again at the University of Kentucky), and Berea (with Union Church). Many speak eloquently and forcefully about what we are allowing to happen to the people and land of Kentucky during their own readings and presentations. In October 2005, the authors released Missing Mountains, a 200-page anthology of their writings about their love for Kentucky and distress at what coal mining is doing to destroy those things about Kentucky that we value. The Authors Tours also spurred the involvement of musicians who have created their own projects to help stop mountaintop removal, including the CD Songs for the Mountaintop, produced for KFTC. This involvement spurred the formation of the group Public Outcry, and many other musicians including Ben Sollee, Daniel Martin Moore, Jim James and others have performed to benefit KFTC and putting an end to mountaintop removal.